Keeping up with everything that needs to get done around the house feels like a joke sometimes. I mean, I clean up the hall closet and get everything looking good, turn around, and it's destroyed! Oy. I can't handle it sometimes. I think this definitely explains why I try and walk away from LOTS of things that don't come easily to me. I bought a guitar in college because I was determined to learn to play... or so I thought. When I couldn't get my fingers to cooperate after a month or so of trying I set it aside and now it lives at my sister's house... 300 miles away. It didn't happen easily or how I pictured so I didn't bother. Household tasks are very much the same for me. Why should I bother sweeping the floor today when it's just going to be full of crumbs again tomorrow? What's the point in wiping down the bathroom sink because the kids are going to spit toothpaste all over it again in a few hours. This is a VERY dangerous mindset because I end up putting off LOTS of easy tasks that would help our home feel much less crazy. Oh sure, the shoes will fall out of the closet again because the kids feel the need to pull ALL of them out to find the one pair they want... but it still looks picked up for a while. Yes, the stairwell walls will get sticky with hand prints again in a month but for the time being it would be great if they were white rather than speckled with toothpaste and who knows what else. The worst (or best) part of most of these tasks? They take ten minutes or less. Think about your kitchen. If you look at the job of CLEAN THE KITCHEN it can feel super overwhelming because there are so many components to that job. But what about - WIPE OFF THE TABLE. Um, that is about a three minute job. Or perhaps - CLEAN THE MICROWAVE. Again, just a matter of minutes. Same goes for sweeping, loading the dishwasher after a meal, wiping down the counters, or tossing spoiled food. All of these only take a matter of minutes individually, but somehow when we put them together we get panicked over how much work needs to get done. And this is why I created a printable for Ten Minute Timer Tasks. Because sometimes I think I don't have time to get something done around the house. I figure that I'm better off reading a book or browsing social media instead of crossing something off my to-do list. I'm wrong. I do have time for these tasks, I just choose not to do them most of the time and then wonder why my home isn't more tidy. How should you use the 10 Minute Timer Task Printable? I printed mine off and laminated it, then stuck it to the fridge. I only have a black and white laser printer so it isn't as pretty as it could be but the real file is full of fun color. My goal is to complete most of these tasks each week. Some I may not need to do each week, like return a phone call, but all of the items on this list could be completed in ten minutes or less. 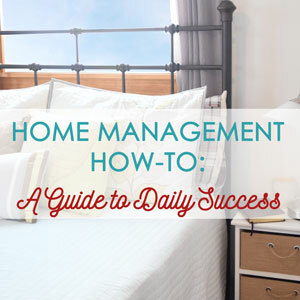 They are perfect for maintenance at home because if we spend ten minutes each week on these areas we can stay on top of the messes rather than let them get unruly and in need of a huge effort. You can approach these tasks in two different ways. 1. Set a timer for 10 minutes and see what you are able to finish in that time. If you have a large pile of laundry, you may not finish it all in ten minutes... but it's better than ignoring it completely! 2. Start a stopwatch and see just how fast you actually can do a task. Many of these will take less than ten, some even less than five! When you realize just how little time some of these tasks take it's a lot harder to push them off to a more convenient time. I'm starting to fit these in while I'm waiting for water to boil, waiting for my kids to finish getting dressed, or waiting for a kid to get done in the bathroom so I can help with the wiping. Yeah... still in that phase around here. Want your own 10 Minute Timer Task printable? Sign up below and have it delivered to your inbox! Plus you will get access to all my other free printables in the Subscriber Library. What tasks do you put off around the house most often?